If you take part in the journey to discover the Ha Giang Plateau, you will be surprised at beautiful peach and plum blossoms at this time of the year as if they were welcoming tourists after Tet. The Lunar New Year festival (Tet) has for years been considered the “great” time for peach or plum blossom to flourish. Dong Van karst plateau in the northernmost province of Ha Giang is often covered with grey. But now, with spring having arrived, white plum flowers, yellow mustard flowers, and pink peach blossoms dazzle the eye. The southern region of Vietnam is entering the peak of the dry season but it is considered the most beautiful season of the year in Dong Van, Vietnam’s north-most are. When the temperature stays at 20 C degree, the rock plateau becomes “magnificent” with all kinds of flowers opening up on cliffs, by roads, along streams or in the garden making the journey to discover the Ha Giang Plateau became a prominent phenomenon for the year's travel in Vietnam. 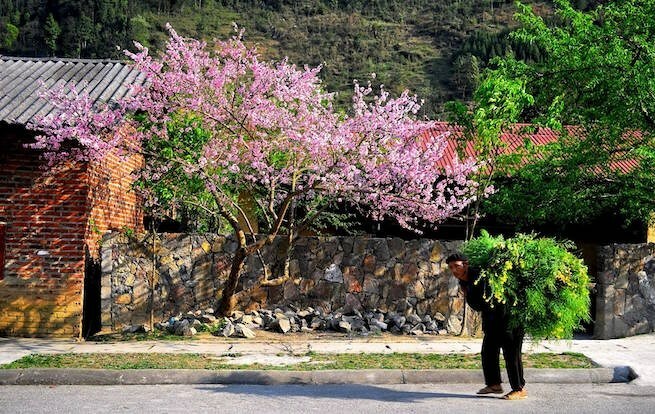 Although the middle of March is not the high peak of the tourism season, flowers in this plateau draw much attention from visitors by its unique beauty. the rocky hamlet is still being decorated by numerous peach and plum blossoms, perhaps the last ones before going to “sleep” till the next blossoming season.